The global white biotechnology market is highly consolidated, as key players are holding 71% share in the global market, reports Transparency Market Research. Prominent players in the market are investing heavily in research and development activities in order to produce effective and better results. These players are also investing in mergers and acquisition, collaboration, partnership, and innovation to get a stronger hold in the market. Apart from key players, few small and medium players are also engaging in these strategies mainly to maintain their position in the market. In this report, researchers have analyzed few leading players including Cargill Inc., Archer Daniels Midland Company, DuPont, BASF SE, and Novozymes. 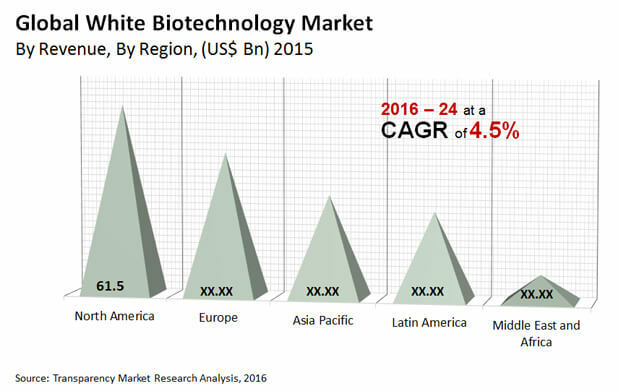 As per TMR’s report, the global white biotechnology market is expected to rise at 4.50% CAGR over the projected tenure between 2016 and 2024. If the market progresses at this rate, the market’s revenue is likely to reach US$262.3 bn by the end of 2024. In 2015, the market earned US$ US$178.1 bn. Rising government initiatives to promote white biotechnology is one of the major factor driving demand in the global white biotechnology market. In addition, white technology is also environment friendly and produces low waste by using efficient methods of production. The white biotechnology cannot be compared with oil and crop prices, as the prices of this technology keep on fluctuating rapidly. Furthermore, growing need from various consumer industries such as consumer goods and automotive to meet sustainability targets is projected to augment technology demand over the projected period. Adding further to the growth factors, increasing government support to growth of white biotechnology through research and development activities and schemes are also expected to expand growth opportunities for the global white biotechnology market. Moreover, increasing demand for green chemicals in developed regions who are ready to pay higher prices for renewable products will further accelerate demand in this market. The key challenge that might hamper the growth in the global white biotechnology market includes deteriorating fertility of agricultural lands. This takes place due to over and misuse of fertilizers upon crops that resulted in depleting fertility from agricultural lands. Due to over utilization of fertilizers, the prices of bio-crops have been fluctuated, as there was uncertainty of production yield of bio-crops. Moreover, use of traditional foods and fuels by customers is also expected to hamper growth in the global white biotechnology market. The study presented here is based on a report by Transparency Market Research (TMR) titled “White Biotechnology Market (Product - Biochemical, Biofuel, Biomaterial, Bioproduct; Application - Food and Feed, Pharmaceuticals, Pulp and Paper, Textile, Energy; Feedstock - Grains and Starch Crops, Agricultural Residues, Food Waste, Forestry Material, and Animal) - Global Industry Analysis, Size, Share, Growth, Trends, and Forecast 2016 - 2024”.